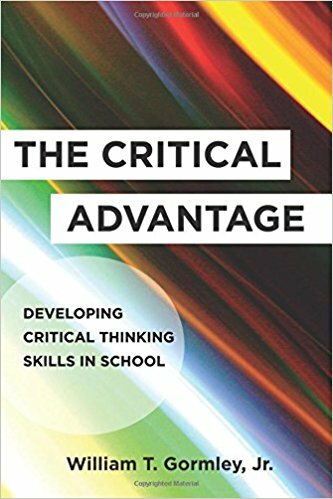 Abstract: In The Critical Advantage, noted scholar and early childhood expert William T. Gormley, Jr. takes a wide-ranging look at the important role of critical thinking in preparing students for college, careers, and civic life. Drawing on research from psychology, philosophy, business, political science, neuroscience, and other disciplines, he offers a contemporary definition of critical thinking and its relationship to other forms of thinking, including creative thinking and problem solving. When defined broadly and taught early, he argues, critical thinking is a “potential cure for some of the biggest problems we face as a nation,” including education deficits, employment deficits, and the recent surge of partisanship in democratic politics. While there are encouraging signs—the Common Core State Standards have drawn attention to the importance of critical thinking—recent efforts have been too narrowly focused on improving textual analysis in high school. Those who might benefit the most from curricula prioritizing critical thinking, including disadvantaged students, are less likely to be represented in courses and other activities that encourage this skill. Gormley argues for prioritizing critical thinking skills in PreK–12. He takes readers into innovative classrooms around the country, including schools in Pennsylvania, Oklahoma, and Virginia, and offers specific recommendations for promoting critical thinking and embedding it across the curriculum.